Peter Gilmore’s Quay Restaurant Sydney is probably the most critically acclaimed Australian restaurant on the international stage at the moment and Australia’s most awarded. It ranked 29th on the 2012 San Pellegrino World’s Best Restaurants List, the only Australian restaurant to make it into the top 50, and it holds ‘Three Hats’ from the influential Sydney Morning Herald Good Food Guide’s restaurant rating system, the maximum possible. Peter Gilmore is also something of a celebrity chef in Australia, with appearances on the ever-popular Australian version of Masterchef. He also won the Sydney Morning Herald Good Food Guide’s Chef of the year award in 2012. 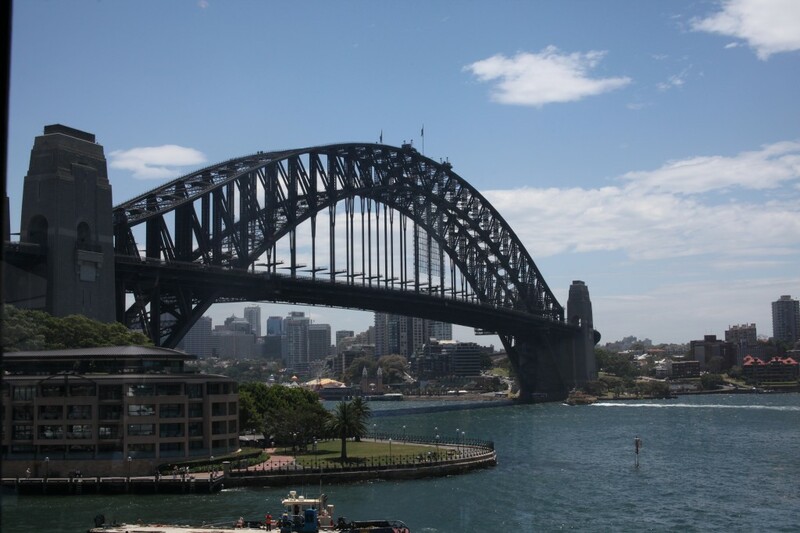 One of the winning factors about Quay is its location right on Circular Quay West which offers diners some of the most spectator views of Sydney Harbour. Quay is spread over two floors, and to maximize on the views the tables are arranged along the windows as if at a 90 degree angle. On one side of the restaurant you get the Harbour Bridge, and on the other you have The Sydney Opera House. Otherwise there isn’t much else to the décor. It’s all white-linen laid tables and blue carpet. It’s worth noting that the view of The Opera House is sometimes obstructed when cruise ships are docked in the Harbour although the restaurant will advise you of whether this will be the case at the time of your booking. Quay offers a three-course lunch for $125 (about £80), a four-course lunch for $145 (about £93), and a four-course dinner for $165 (about £106). There are four options per course. 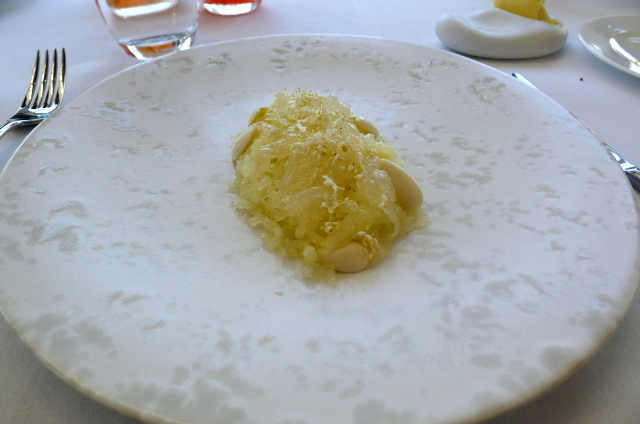 There is also a nine-course tasting menu for $220 (about £141). 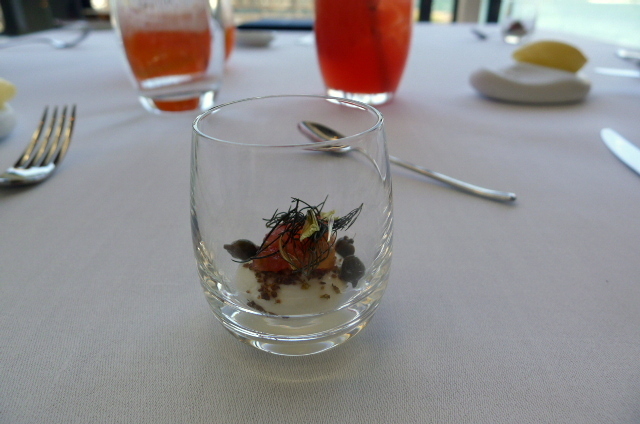 We went for the four-course lunch that kicked off with a lovely amuse bouche of goats curd, tomatoes, capers and grass fennel. It looked beautiful and was springy, refreshing and light. 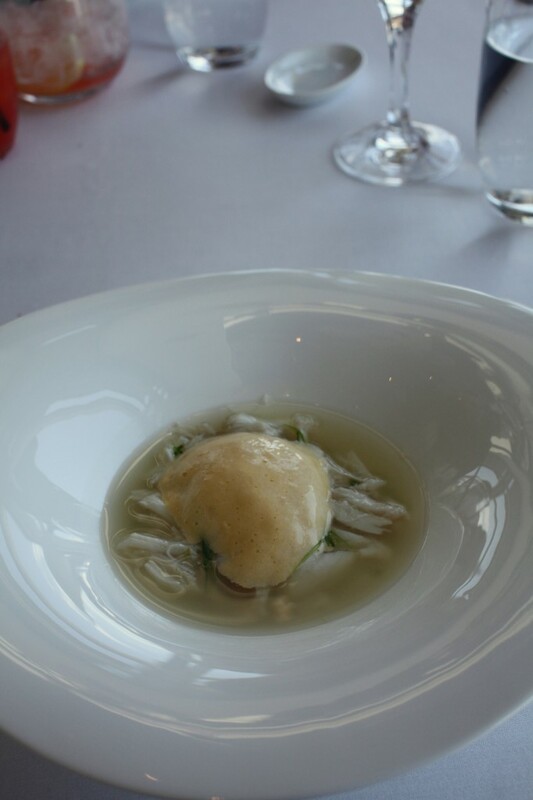 Gilmore’s classic congee dish of Northern Australian mud crab with fresh palm heart and egg yolk emulsion is one of his signature dishes at Quay, and there was a real flair and elegance to this starter. The light and airy congee merged beautifully with the sweet, sweet, crab making it truly delectable. The flourish of the emulsion put a final glorified stamp to this wonderful dish. A fragrant poached chicken with white radish, sea scallops, pea blossoms, smoked white eggplant cream and virgin black sesame oil was beautifully cooked and pleasant. 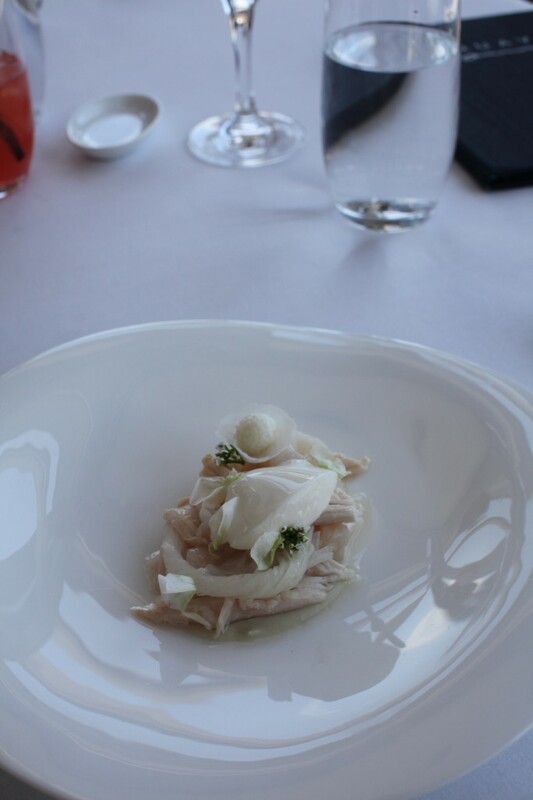 However, a sashimi of local lobster, bergamot, green almonds, grapefruit and elderflowers was a huge disappointment in what was a poorly designed dish. This dish was intentionally served cold, but it was so cold that all one got was the icy coldness of the food. The result was you couldn’t really taste the flavours of the dish, particularly the lobster. For me, this dish was pointless. Smoked and confit pig cheek was very tender and tasty. Served with shitake mushrooms, shaved scallops and Jerusalem artichoke leaves, it came together for a very pleasant taste sensation. 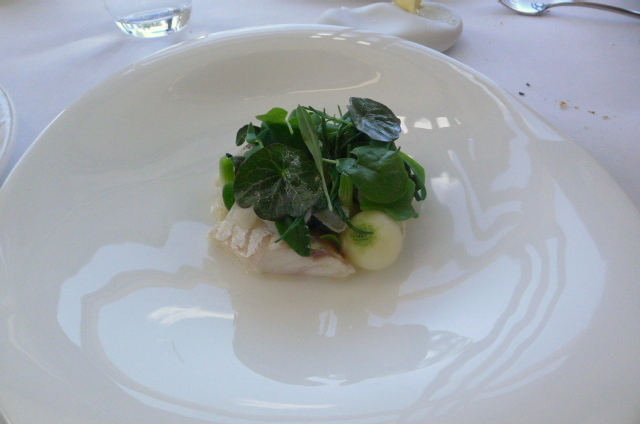 However, a dish of tiger flathead fish with salt-cured oyster cream, ice plant, sea cabbage and abalone tasted a bit flat. There was no question about its quality and freshness, nor did it taste bad, but it was all just a bit dull. A Berkshire pig jowl was wonderfully tender and flavoursome with a deep rich flavour. 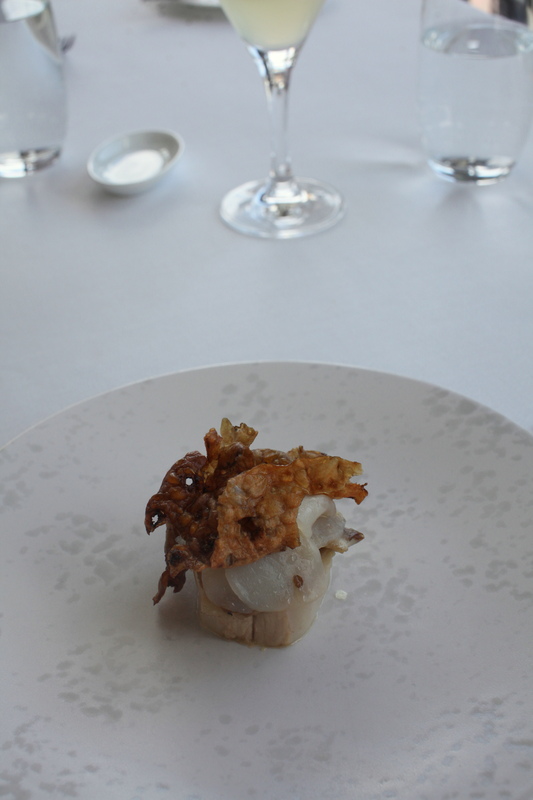 It was topped with some perfectly cooked maltose crackling that was both crunchy and slightly sweet, fantastic in fact. 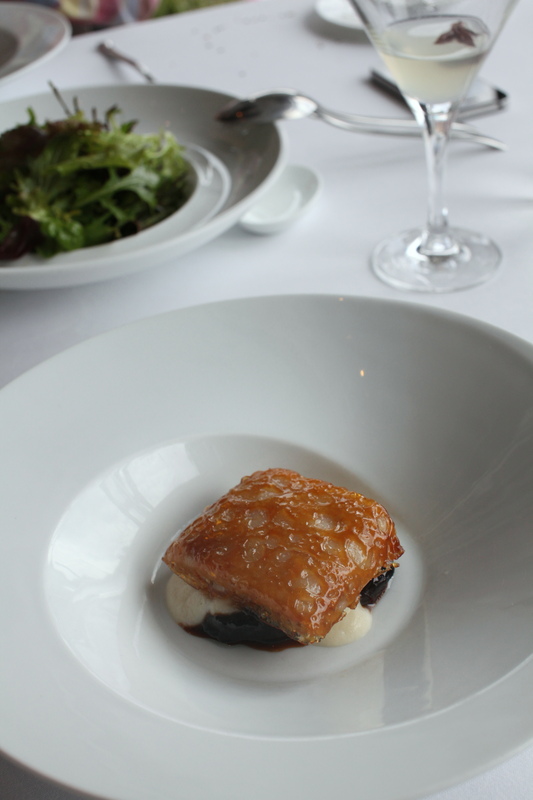 Pairings included prunes and a cauliflower cream perfumed with prune kernel oil that went handsomely with the pork. Hawkesbury free range chicken cooked in Vin Jaune and cream was nicely cooked and the sauce was delicious. 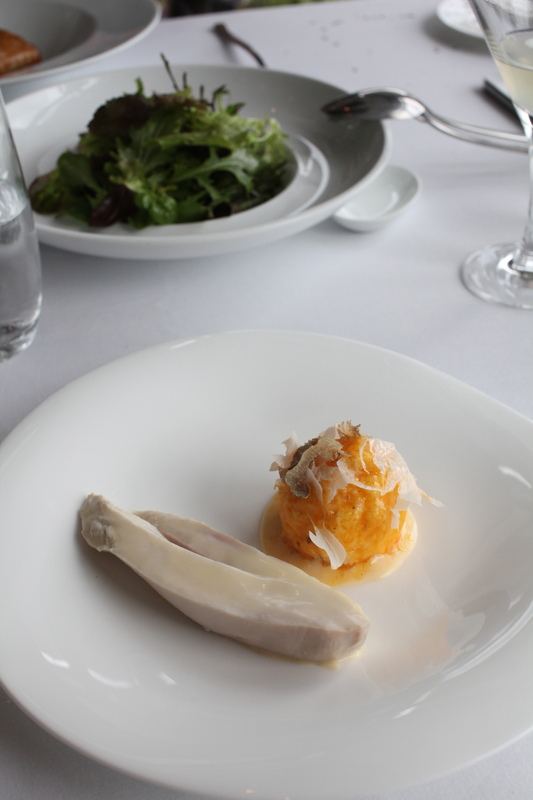 Accompanying the chicken was a steamed brioche with an egg yolk confit and toppings of Alba truffle. As far as steamed brioche goes, it was delicious, but as far as accompaniments go, it was a wee bit stodgy. The plate could have perhaps done with some other side of vegetables. For greens, there was one very nice green salad for sharing amongst the three of us. There is a YouTube video which shows the makings of Quay’s eight texture chocolate cake and the theatre of the melting chocolate effect. The eight varying layers were truly good and came together wonderfully to deliver this combination of rich chocolate-y goodness. 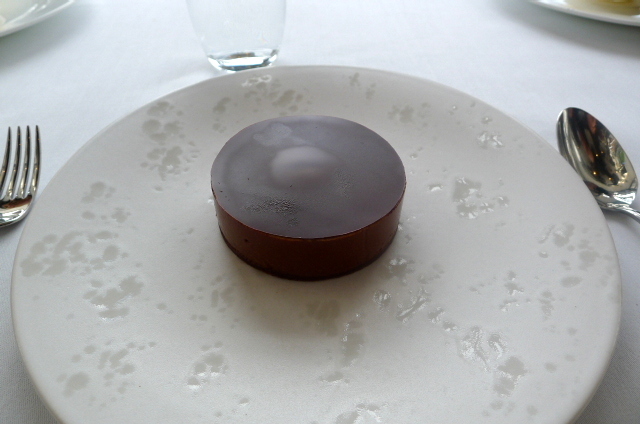 A truly complex dessert, the top layer was however slightly messy in its finish. And other than the cake, there was also nothing else on the plate. A few more elements, and the dessert would not have seemed so lonely to look at. 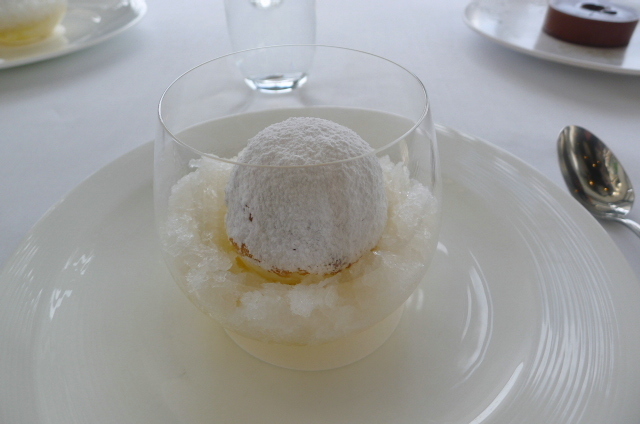 A second signature of white nectarine snow egg was fantastic and has since achieved immortality since being featured on the Australian version of Masterchef. A soft poached meringue with a custard centre, it is supported by a lovely base of white nectarine granite. This is a highly complex dessert involving many steps and it was truly magical to the taste. You couldn’t deny the sheer beauty of some of Gilmore’s dishes, for example the congee and the snow egg. He is no doubt he is a star chef. But you then have to question the sense in almost freezing a lobster dish to the point where you can’t really taste the ingredients, or the inspiration behind some of the dishes, where as beautiful as the ingredients and the technique were, the dishes seemed to taste flat. On the whole I wasn’t mesmerised by the food at Quay, nor did the hugely stuffy and rather snooty service help the dining experience. I couldn’t fault the superlative cooking technique – it’s all very gentile and refined. But not all aspects of the meal captivated my imagination – this meal was a mixed bag- and with all the accolades Quay has received and it’s standing on the world stage I had expected just a little more. Note: Exchange rate used correct at the time of this restaurant review. I dined at Quay with FoodPornNation and another friend.